Contoured bamboo seat cushion takes the pressure off while you sit. Orthopedic-grade memory foam cut-away cushion is designed to keep you properly aligned and supported, helping to relieve sciatica pain, back fatigue and leg numbness. Removable cover with easy-carry handle features bamboo fibers for moisture-wicking, stay-cool softness and hypoallergenic, antimicrobial protection. Bamboo cushion measures 17 1/2” wide x 14” deep x 3” high overall, with 3” wide x 5” deep cutout. 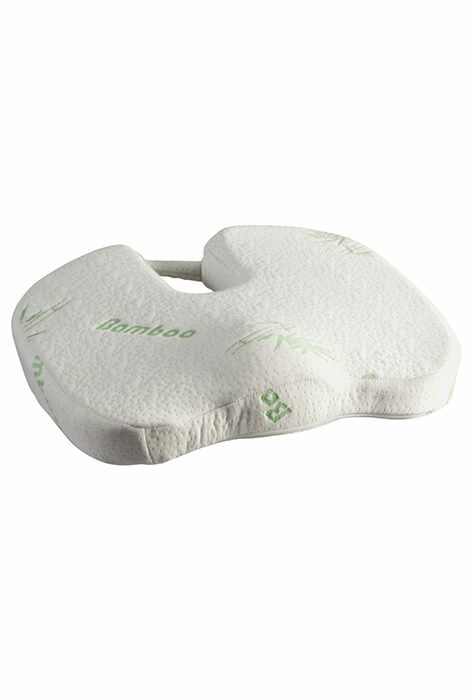 Polyurethane foam cushion; 40% bamboo/60% polyester cover. Machine wash cover in cold water; tumble dry low heat. Spot clean pillow. Helps relieve sciatica pain, back fatigue and leg numbness. Removable cover with easy-carry handle. Bamboo fibers offer moisture-wicking, stay-cool softness and hypoallergenic, antimicrobial protection. 17 1/2” wide x 14” deep x 3” high overall. 3” wide x 5” deep cutout. 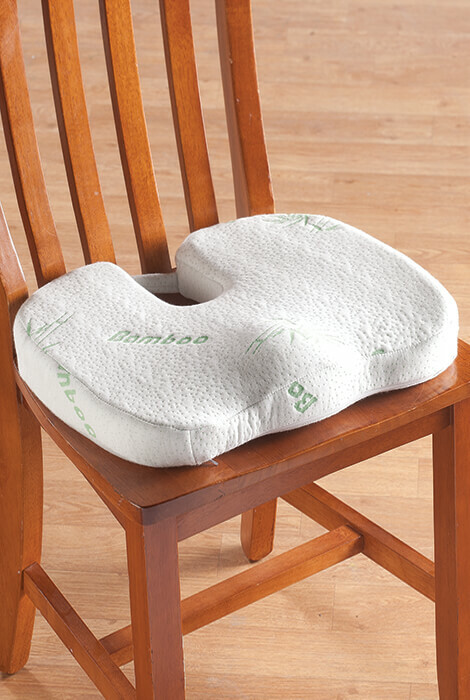 Polyurethane foam cushion; 40% bamboo/60% polyester cover. Machine wash cover in cold water; tumble dry low heat. I have been dealing with severe sciatica pain along with the flu. I have been unable to rest because if can't get comfortable. I bought one of these for home and another for the office. I need something to take the pressure off and the price is great!